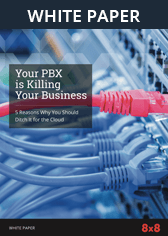 Unified Communications, UCaaS, And VoIP | 8x8, Inc. If you have been frustrated by traditional telephone services or looking for communication tools that can better meet the fast-evolving needs of your organization, you have probably come across technologies such as VoIP and unified communications (UC). What's Unified Communications (UC) and UCaaS? UC is a communication solution that consists of a collection of real-time and non-real-time communication technologies that provide the user with a consistent and streamlined experience across a variety of devices and platforms. These UC technologies include Internet telephony, instant messaging, screen sharing, file sharing, video conferencing, speech recognition, call control, call center functions, voicemail, email, and SMS. The different components can be combined into a single user interface and integrated with other platforms to deliver seamless communications, facilitate collaboration, and improve customer service. For example, a UC system can transcribe a voicemail from a customer into an email, which is then sent to a team member who will read the email and use Internet telephony (VoIP) to return the call. The three different programs -- voicemail, email, and VoIP -- are integrated, or "unified," to work seamlessly in a communication workflow. Unified-Communications-as-a-Service (UCaaS,) refers to the delivery of business communication tools via a single platform by a cloud vendor. It's typically subscription-based, which allows companies to purchase as many features and capacity as they need at any given moment to meet their needs. VoIP stands for Voice over Internet Protocol. Unlike a traditional system that uses cabling, VoIP enables users to make phone calls over a network connection they're already using for Internet access. VoIP calls are made using internet-compatible handsets or softphones and can be managed in-house as on-premises solutions or delivered as a cloud-based service vis a hosted VoIP service provider. One of the major benefits of using VoIP for business is cost saving. In addition, organizations can take advantage of the technology's service mobility, versatile features, scalability, and reliability to improve internal and external communications. Not to mention, the use of a VoIP system helps organizations simplify their infrastructure, allowing them more flexibility and mobility to conduct business efficiently in today's global economy. UCaaS Vs. VoIP - What's the Difference? While both UCaaS and VoIP services are mostly cloud-based, the major difference between these two communication technologies is the scope of the service. Most VoIP solutions focus on Internet-based voice calls. On the other hand, UC offers solutions for organization-wide communication and collaboration that covers more functionalities and a larger scope. Some VoIP solutions do include certain features found in UC technologies, such as voicemail, instant messaging, and video calls, yet they typically don't offer the extensive capabilities of UC solutions. In most cases, the "voice" portion of UC is powered by a VoIP platform. These two technologies can be integrated seamlessly to provide a wide range of communication capabilities to businesses. Do you need video in your communications? Video conferencing allows your team to conduct interactive meetings, share screens, and enhance client communications. If video communication is essential, then you'll need a UC solution. How important is multi-media communications? The younger generation of customers and employees often prefer chat and text messaging over voice calls. UC solutions unify messages via different media into an integrated inbox to help eliminate communication hurdles. What kind of internal collaboration is required? Effective internal communication is critical for facilitating team collaboration. If you have a large team spread across a wide geographic region, then you'd likely benefit from the capabilities of UC solutions, such as document sharing and integration with other productivity apps, to streamline workflow and increase efficiency. What level of flexibility and functionalities is required? UCaaS and cloud exchange makes it possible to access services from a marketplace of partner cloud vendors so you can add functionalities as you need them.